Buried beneath a leafy canopy and camouflaged by summer shrubbery, this brick skew arch bridge has kept its integrity 116 years after its construction and 67 years after the last trolley ran through it. 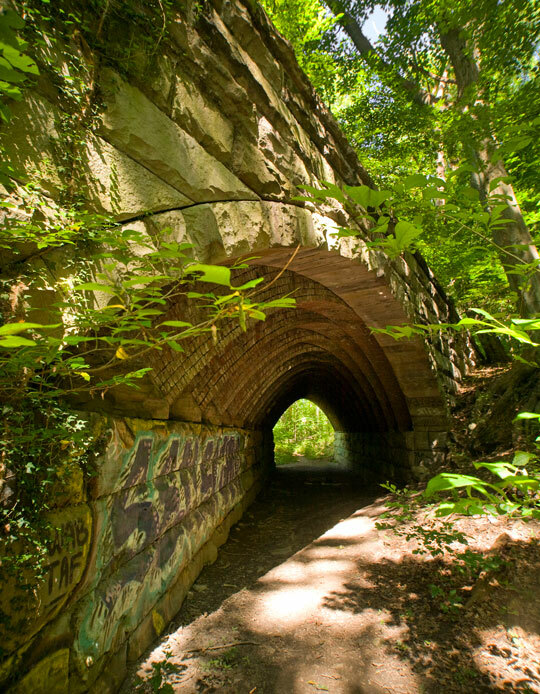 Originally built for the Fairmount Park Transit Company in 1897 with 15 consecutive angled brick arches, the “Chamounix Tunnel” ported trolleys that ran a loop through the park under Old Chamounix Road. That road was struck from the grid long ago and now serves as both a mountain bike trail and a footpath for travelers en route to the Chamounix youth hostel.